Congress president and UPA chairperson Sonia Gandhi today underlined the importance of nuclear energy for the country at the juncture when steeping crude oil price is posing a challenge before the world. After days of uncertainty, Gujjar leaders today held talks with the Rajasthan government in a bid to find ways to resolve their 22-day-old stir for the ST status and agreed to continue the parleys tomorrow. The Supreme Court today said there was a need to impose stricter punishment on those infiltrating into the country from neighbouring countries like Pakistan and Bangladesh. This World Blood Donors Day, the government hospitals across India would be braving yet another day of crisis due to reigning shortage of blood. The latest data on blood collection in the public health sector shows a gap of about 2.4 million units. The recent National Family Health Survey (NFHS-3) report has exposed many irregularities persisting in Uttarakhand. The survey was conducted by the Indian Institute of Population Sciences (IIPS), Mumbai, the nodal agency of ministry of health and family welfare. Realising the growing needs of fighting a war in the Himalayas, India will add about 25,000 more troops as part of its process to have two more mountain divisions. Each division will have about 10,000 to 13,000 men. Shaking off its inertia, the Congress is gradually getting its act together and has begun preparations for the long season of electoral battles ahead. The Vishav Hindu Parishad (VHP) and the Akhil Bharatiya Sant Samiti (ABSS) would jointly decide the further course of action of the religious organisations on “Ramjanam Bhoomi” and “Ram Setu” issues in the three-day meeting sessions at the holy town from June 14 to 16. “The VHP leadership and various saints from the different Gadhis (religious chairs) across the country reached here today and the most important religious meeting will start on Saturday,” said Swami Hans Dass, ABSS national general secretary. Lok Sabha Speaker Somnath Chatterjee today expressed hope that women’s reservation bill ensuring 33 per cent quota for women in elected bodies would become part of the Constitution during his tenure as Speaker. The Archaeological Survey of India (ASI) in association with the Forest Research Institute (FRI), Dehra Dun, has taken an initiative for the maintenance and conservation of trees at Ta Prohm temple complex, Siem Reap, Cambodia. India has reaffirmed its collective and abiding commitment to the unity, integrity and development of Afghanistan. The Bharatiya Janata Party (BJP) has promised to scrutinise background of its donors, before accepting donations from them. A Bangalore-based scientist died while his wife was battling for life after the family consumed poison in a suicide pact in a city hotel last night. Maoists call for 12-hour shutdown in Gaya. New airbase for Coast Guard close to Pak border. Families await justice 11 yrs after Uphaar Cinema fire. A special camp for specially abled children. Bamboo opens new avenues of self-employment. ‘Khushboo’, a lighthearted love story. Addressing a farmers’ rally organised by the ruling Congress here today, Sonia said spike in global crude oil prices had enhanced the importance of nuclear energy. She also launched a diatribe on the opposition political parties for trying to derive political mileage out of the escalating prices of commodities in the wake of steep rise in crude oil prices and subsequent hike in prices of petroleum products in the country. “Major challenges that the country faces at present are inflation and escalating prices. The prices of petroleum products in our country are still much cheaper than that in the neighbouring nations and many parts of the world as the government has taken on tremendous pressure to absorb the impact of the price rise,” Sonia said. 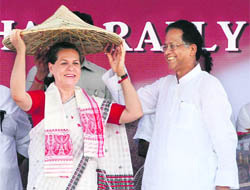 Addressing the rally, Assam Chief Minister Tarun Gogoi said about 22 lakh farmers of the state would be benefited from the Centre’s decision to waive farm loans and an amount of Rs 283 crore would be required for it. He added that the Assam government would bear Rs 93 crore of the required amount. Gogoi announced that the state government would provide 3 per cent subsidy on agricultural loan up to Rs 25,000 besides waiving the land revenue. The state government would also charge only Re 1 as land revenue from farmers. He said the government would soon provide 2,600 tractors and 6,000 power tillers to the farmers. Meanwhile, bandh called by some Adivasi organisations in eastern Assam districts in protest against Sonia’s visit had partial impact on life. All long-distance buses were off the highway because of the bandh call. The ruling Congress is out to showcase the successful farmers’ rally to silence the opposition parties that are demanding ouster of the Gogoi government on charges of rampant corruption in the wake of the recent arrest of former education minister Ripun Bora by the CBI on the charge of bribery. Meanwhile, Sonia Gandhi today presented the Srimanta Sankardeva Award to eminent journalist B.G. Verghese and noted Vaishnavite scholar Dr Keshavananda Deva Goswami at a function here this evening. 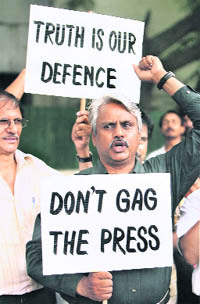 Verghese received the award, the highest civilian award constituted by the government of Assam, for the year 2005, while Dr Goswami was awarded for the year 2006. “The talks have been held in a very cordial atmosphere,” BJP MP Ram Das Agarwal, who was part of the government’s nine-member team, told. Besides ST status, they have been demanding an ex-gratia payment of Rs 10 lakh for the next of the kid of those killed in police firing and a job for one of the family member of the deceased. They are also demanding a compensation of Rs three to five lakh for the injured. Agarwal refused to divulge details about the deliberations and said the parleys would continue tomorrow. Bainsla did not attend the parleys. He is camping with his supporter in Bharatpur’s Karwadi-Pilupura area, the nerve centre of the agitation. Asked if Gujjar leader Kirori Singh Bainsla will be joining tomorrow’s talks, he said, “It depends on him. We will welcome him if he comes for the talks”. “Considering the large number of infiltrators, who come to India without valid document, there is a need for imposing stricter sentence,” a Bench observed, while dismissing the appeal filed by a Pakistani infiltrator Habib Ibrahim. The Bench rejected the plea of Ibrahim that he had illegally entered India to meet his wife and children in Jaipur and was ignorant of the country’s immigration laws. “Appellant’s (Ibrahim) feeble plea that he did not know that he is required to be in possession of valid document is without substance. Otherwise, he would not have obtained any transit visa for Nepal,” the apex court observed. This World Blood Donors Day, the government hospitals across India would be braving yet another day of crisis due to reigning shortage of blood. The latest data on blood collection in the public health sector shows a gap of about 2.4 million units. While the demand of blood in the country last year was about 8.5 million units, the government health set up could collect only 6.1 million. The gap is naturally pinching the already-neglected rural sector, which houses 70 per cent of the population but does not get its rightful share in the total blood collection by the government. In fact, the four metros - Delhi, Mumbai, Chennai and Kolkata - are taking away bulk share of available blood. Ten per cent of country’s blood is being used in these metros. Alarmed by the pressures, this situation is exerting on blood availability elsewhere, the government is now planning four high-volume blood banks in four metros. These banks will also fit into the government’s strategy of disaster management. “Besides catering to the massive demand of blood in the metros where high-specialised health set ups exist, high-volume blood banks will also come handy in time of disaster. Besides, they will act as demonstration centres for other blood banks,” top officials said, adding that the idea is to streamline blood availability in the urban centres and the surrounding areas by consolidating the smaller blood banks existing there. Among the four metros, Kolkata has the maximum yearly demand of blood at 4.67 lakh units. This is more than half of West Bengal’s total annual demand of blood at 8.1 lakh units. Second in the line is Mumbai which, with its annual demand of 3.78 lakh units of blood, makes up 43 per cent of Maharashtra’s total yearly demand, which is 8.8 lakh units of blood. Chennai’s demand of 2.71 lakh units annually also accounts for 43 per cent of Tamil Nadu’s total yearly demand of blood (6.2 lakh units). Delhi needs 3.4 lakh units of blood annually. The move to set up metro blood banks also aims to remove regional imbalances in the supply of blood collected in the government system. The health ministry officials admit that the existing gaps in demand and supply of blood must be met through public health set up because 70 per cent of the population is poor and in villages. The survey is based on a sample of 2,659 households. 2,953 women aged between 15 and 49 and 983 men aged between 15 and 54 were selected for identified sample area and were interviewed. The state shows only 33 per cent of the institutional deliveries as compared to other states like Maharashtra, Tamil Nadu amd Kerala showing the delivery status of 65, 88 and 99 per cent, respectively. The data proves that nearly 67 per cent of the women undergo delivery without any medical assistance. Home births are common among women who received no antenatal check ups. Also, only 60 per cent of home births use a clean blade to cut the cord. Similarly, only 32 per cent of the women had a postnatal check up, the rest 63 per cent receive no such facility. The reports also revealed that only 31 per cent infants are put to breast-feeding in the first six months. Also, 44 per cent children under age of five years are stunted or too short for their age, which indicates that they have been under-nourished. Not only China and Pakistan abut the Indian Himalayas, but also border areas like Kashmir valley, Arunachal Pradesh and Sikkim require specialised fighting units. The move is aimed at providing more teeth to India’s existing mountain warfare machinery. The defence ministry’s proposal for raising the two mountain divisions was recently approved by the Cabinet committee on security, sources said. The proposed divisions will further enhance tactical strength of the Army in strategically important areas. The mountain divisions are usually trained for specialised warfare and the troops carry specialised weaponry for operations. Most troops for the two new divisions would be pooled from existing Army units. However, new battalions and brigades could be raised to augment the strength of the new divisions, sources added. The Army already has 10 divisions dedicated to mountain warfare and another infantry division earmarked for high-altitude operations. The raising of the mountain divisions will be done in two phases. Under the first phase that will be implemented in two years, two new division headquarters along with a brigade would come up. It would also include the headquarters’ support system like signals and intelligence units. Implementation of the second phase would take another two to three years. During that period, the division would be ready for operation. At the end of five years, the two divisions would also have air elements functional. The air assets would include helicopter gun ships and attack helicopters to provide the two divisions capabilities to carry out manoeuvres for countering high mountain terrain. The gun ships and attack choppers will be necessary for providing the two formations fire power in mountain terrain, as the Army cannot deploy tanks and armoured vehicles there, sources said. Firstly, a special committee, headed by AICC general secretary Mukul Wasnik, has been set up to look at the publicity campaigns for the election-going states of Madhya Pradesh, Rajasthan, Chattisgarh, Delhi and Jammu and Kashmir. Rahul Gandhi is a member of this panel. Secondly, Digivijay Singh, AICC general secretary in charge of Uttar Pradesh, has set the ball rolling to identify the party’s Lok Sabha candidates in this crucial state. With emphasis on micro-management, he called a meeting today to discuss the Jat-dominated seats of western Uttar Pradesh. Thirdly, union minister Mani Shankar Aiyar, convener of the AICC’s Panchayati Raj Sangathan, convened a meeting of PCC presidents and state sangathan chiefs today to see how Panchayati Raj institutions can be used to reinvigorate the Congress at the grassroots. Fourthly, AICC treasurer Motilal Vora and other senior leaders met representatives of an advertising firm to discuss the party’s poll campaigns. All this is in addition to the formation of a panel, headed by defence minister A.K. Antony, which is to suggest steps to re-energise the party for the coming assembly and Lok Sabha elections. Its report will serve as a basis for wider discussions at a proposed “chintan shivir” of senior party leaders next month. The publicity committee, headed by Wasnik, also includes Anand Sharma, Jairam Ramesh, Vishwajit Prithvijit Singh and the PCC chief, legislature party leader and AICC general secretary of each state. Wasnik said he was getting in touch with the state leaders concerned and the panel was likely to have its first meeting next week. Having realised that it paid a heavy price in the recent assembly elections for not consulting local leaders in the selection of candidates, the Congress is making amends for this lapse. Digivijay Singh made it a point to invite western UP MPs, Manvendra Singh, Brijender Singh and Surinder Goyal, for today’s meeting where they identified their strong seats and best candidates for the 26 constituencies in this region. “We also reviewed the organisational structure in this region to see if the district and block-level committees are in place and whether they need to be revamped,” said Digivijay Singh, who has often said the party organisation in UP was in disarray. UPPCC president Rita Bahuguna Joshi, who also attended the meeting, said they had adopted a sectoral approach and a similar exercise would be conducted for other regions like Rohilkhand, central and east UP, adding that they hoped to complete their work within three weeks. He added that all the decisions regarding the construction of Ram Mandir on Ram Janam Bhoomi at Ayodhya and to save the historical Ram Setu at Rameshwaram, including the other issues of increase in the militancy incidents and to save the holy Ganga from pollution would be finalised in the meeting jointly by VHP leaders and Sadhu Samaj. “VHP international president, Ashok Singhal, international general secretary, Parveen Bhai Togadiya, spokesperson and advisor, Giriraj Kishore and Omkar Bhave have already reached here and address various meeting with different religious thinkers before the three-day long session of meeting with Shri Ram Janam Bhoomi Andolan Samiti,” Swami Hans Dass further added. Earlier, Ashok Singhal and Parveenh Togadiya chaired a secret meeting at Gian Temple on Thursday, in which the issues related to Ram Janam Bhoomi and Ram Setu were discussed. The sources in VHP informed that the organisation and Sadhu Samaj would discuss the final date to initiate the further steps on the Ram Temple and to unite the Hindu organisations on a common front. Women’s participation and empowerment at all levels of society was undoubtedly the key to propelling democracy forward. “I hope the revived interest in the proposed legislative initiative will be pursued to its logical conclusion,” Chatterjee said while delivering E.M.S. Namboodiripad Memorial Lecture on “Democratic Consolidation: The Indian Experience” here. Earlier, during 2006, Dr S.S. Negi, director, FRI, and Dr Sas Biswas, Tree Taxonomist, FRI, visited Ta Prohm to assess the status of tree flora and other aspects influencing tree condition and health in that area. The report of the first visit emphasised the need for a systematic study for evolving an effective conservation strategy for trees in the temple area. Accordingly, the ASI proposed and sanctioned a project in April 2007 for an one-year duration. A total of 131 trees are recorded in the study, which belong to 25 species. Tetrameles nudiflora was the most dominant tree species with 38 individuals followed by Diospyros decandra with 15 individuals. Aloke Sen, Indian Ambassador to Cambodia at Phnom Penh, was also briefed about the studies carried out by the FRI.
Later, a presentation was made in the 17th ICC Technical Committee Meeting convened at Siem Reap. The interventions made by the FRI and the future plan of work for the conservation of trees was accepted and the 17th ICC Technical Committee invited the FRI to involve the APSARA National Authority of Cambodia and its Forestry and Cultural Landscape and Environment Department in tree care operations. For this purpose, the APSARA National Authority would send the proposal to the Indian Embassy through the ASI. There is a proposal to form a forestry consortium by the Forestry and Cultural Landscape and Environment Department of the APSARA National Authority of Cambodia, in which the FRI assistance is being sought to prepare the working plan of the forests in and around Angkor Wat. A preliminary survey was conducted in the forests along the roadsides to Angkor Wat and Angkor Thom to take stock of the situation of the forests and the threats being faced by them. The future plan includes treatments for specific trees and their implementation by the Forestry and Cultural Landscape and Environment Department under the technical guidance of the FRI and also the capacity building of Cambodian technicians involved in conservation activities by the FRI. In a statement at an international conference in support of Afghanistan in Paris, minister of state for external affairs Anand Sharma said India supported the Afghan-owned and Afghan-led process to propel the country on its path of stability, security and prosperity. He hoped the Paris conference would buttress the implementation of the Afghanistan National Development Strategy (ANDS). The conference, held yesterday, brought together high-level representatives of 67 countries and 17 international organisations, including Afghan President Hamid Karzai, UN Secretary General Ban Ki-Moon, US First Lady Laura Bush, US secretary of state Condoleeza Rice and British foreign secretary David Miliband, the External Affairs Ministry here said. The conference was opened by French President Nicolas Sarkozy. Anand Sharma spoke about India’s expanding partnership with Afghanistan, consisting of multi-dimensional cooperation programmes in all parts of the embattled nation covering virtually all sectors. These range from infrastructure in medical services and community-based small development projects. India is also contributing to human resource development in Afghanistan. The minister reiterated India’s long-term commitment to the Afghan people. India is the sixth largest bilateral donor to Afghanistan. Participants at the conference acknowledged and appreciated India’s sustained engagement in the reconstruction and development of Afghanistan. It was specifically mentioned by Afghan foreign minister Rangin Dadfar Spanta in his speech. On the margins of the conference, Anand Sharma had bilateral meetings with President Karzai and his foreign minister, French foreign minister Bernard Kouchner and deputy foreign minister for human rights Rama Yade and Norwegian foreign minister Jonas Gahr Store.